Published on 14 June 2012. 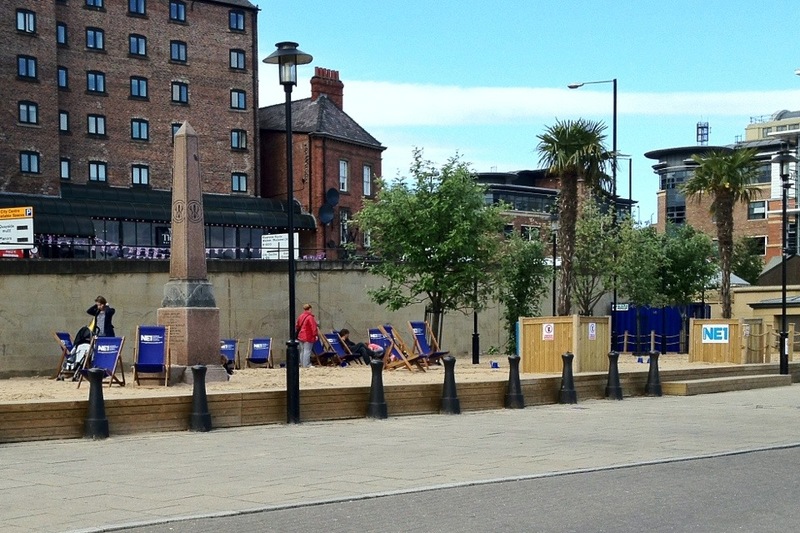 Newcastle’s quayside seaside, a temporary beach on the iconic quayside, has returned for a second summer. It seemed very successful last year – there were kids playing and adults sunbathing every time I passed. The monument is to Charles Wesley, and the beach occupies the Square named in his honour. I do wonder quite whether he’d approve of his monument being surrounded by relatively scantily clad sunbathers… but I guess, given that he’s been dead for 224 years, he’s unlikely to register any complaint. This 1,687th post was filed under: Photo-a-day 2012, Newcastle-upon-Tyne, Religion.